The Ammersee is surrounded by wooded moraine hills. When the Föhn wind is blowing, the Alps to the south look much nearer and form a magnificent backdrop. Numerous marked hiking trails enable the visitor to enjoy the beauty of the surrounding countryside to the full. The lake is just under 50 square kilometres in area and has a circumference of over 42 kilometres. The conditions for many different water sports (sailing, boat hire, swimming etc) are ideal. There are also many attractive towns and villages, including Herrsching with its romantic palace, the "Kurparkschlösschen", Diessen, dominated by St Mary's Minster, Schondorf and Utting with the "Old Villa", Rodenhauser Park and Mathias and Anna-Sophie Gasteiger's House. A further main attraction is Andechs Monastery. 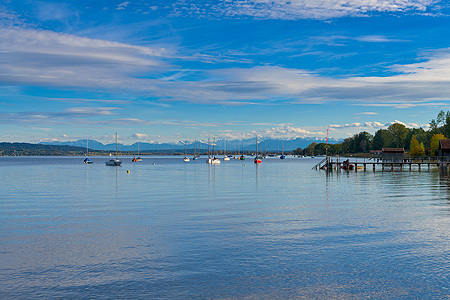 The northern tip of the Ammersee is located around 35 km west of Munich and can be reached on the A96 motorway between Munich and Lindau.